Which Fight Would You Prefer To See Anthony Joshua Take In April: Dillian Whyte Or Jarrell Miller? With Tyson Fury and Deontay Wilder working out a deal for their big rematch, Joshua is somewhat playing second fiddle in the current heavyweight division. AJ remains a huge (as in really huge) draw of course, but there are doubts a rematch between he and Whyte would result in a Wembley sell-out, hence the strong possibility the 22-0(21) star could head to America next instead. But of the two most likely options Joshua has, which fight makes most sense to you? Which fight would you be more wiling to pay to watch? On the one hand, Whyte, beaten only by AJ as a pro, is by far the most deserving fighter of the two; Whyte having boxed and beaten better and higher ranked opposition than Miller. But maybe the fans would prefer to see AJ take a fresh approach and box “outside of his comfort zone,” as his constant fighting at home as been referred to by some, and head to the US to tackle Miller. Miller has been calling for a world title shot, against either AJ or Wilder, for some time. Has the unbeaten New Yorker done enough to deserve one, though? Wins over Tomasz Adamek, Bogdan Dinu and Johan Duhaupas might not be enough in the opinion of many. Certainly, Whyte’s big wins over Joseph Parker and Dereck Chisora top anything Miller has achieved. But in boxing it’s not always down to what’s fair and what’s not. Whyte should be a few miles ahead of Miller in the line to to get to Joshua, but in the end it will be the champ’s choice. Will Joshua choose to shut up Whyte or Miller in his next fight? 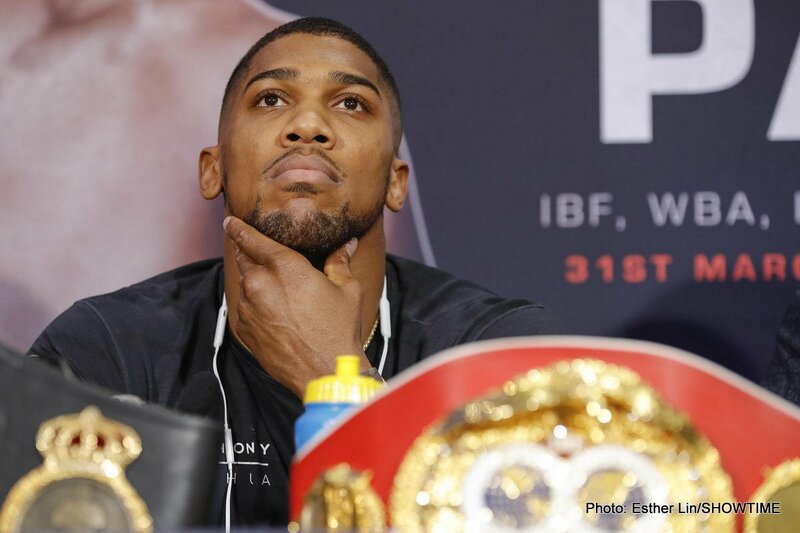 You are here: Home / Boxing News / Which Fight Would You Prefer To See Anthony Joshua Take In April: Dillian Whyte Or Jarrell Miller?